For whatever reason, so many fantasy owners fail to recognize this notion in their drafts. VBD, in essence, is what spawned The Late Round Quarterback, as the difference in quarterback scoring from best to worst starter in a single season isn’t typically very high. In other words, quarterbacks, historically, have been replaceable on fantasy teams because, from a statistical standpoint, they’re not much better than one another. I’ve written about “value” a plethora of times on this site, and I still believe it’s the most important and overlooked word in fantasy football circles. Just because Aaron Rodgers scores the most fantasy points doesn’t mean he’s the most valuable fantasy player (duh). And though running backs typically score more than wide receivers, not all backs should be drafted before all receivers. Though it’s only March, there have already been hundreds – thousands – of mock (and real) fantasy drafts. Most have been of the snake variety, and there’s been a very consistent theme in each one of them: Calvin Johnson has been a mid-first round choice, hovering the 1.06 to 1.10 ADP range. After analyzing these mock drafts, I’ve realized that the Lions’ receiver may not be valued the way he should be. Remember, the goal with value is finding players who are much better than the rest of their positions. Without attaching numbers to this idea, wouldn’t we think Megatron is clearly and obviously the best at his position, and much, much better than anyone else who plays wide receiver? Megatron’s ridiculous 2012 campaign was highlighted by a near-2,000-yard receiving season. Since he broke the all-time single-season receiving record, you’d think he was easily the best fantasy receiver. Unfortunately, Calvin got into the end zone just five times, resulting in a top receiver finish that was barely better than Brandon Marshall in standard leagues. Now, obviously, we shouldn’t project just five scores for Megatron in 2013. Not only did he fall within opponents’ five yard-line plenty of times last year, but the high number of targets and receptions he had in 2012 made his touchdown number a near outlier. Like I’ve said, when you’re drafting – whether in 2013 or beyond – you should be finding players who hold the most value, not pure point total. And in order to do that, projections are very helpful. If you can moderately project how many fantasy points a list of players will score, you can easily match up total fantasy points scored to see just how much better a player is to the rest of his position. And when you’re looking at the “rest of the position”, you’re typically viewing a player compared to a “baseline” player. To keep things simple, think of the baseline player as the worst starter in your league. For a standard 12-team league, the baseline player would be the 12th quarterback for quarterbacks, the 24th receiver for receivers, the 24th running back for running backs and the 12th ranked tight end for tight ends. If, for instance, Jamaal Charles was your top rated back at pick 1.05 and you selected Megatron, you’re now foregoing the chance of having Jamaal Charles. In the second round you may decide to pick Stevan Ridley, who to you, is worse than Jamaal Charles. You’ve lost C-R (Jamaal Charles minus Stevan Ridley) at your RB1 spot by taking Megatron with your first selection. If C-R is greater than J-B, you’d think drafting Charles in Round 1 makes the most sense. But when you consider the idea of predictability, it may appear more advantageous to actually draft Megatron instead of Charles. This is a qualatative aspect of value-based drafting that is overlooked, as player projections are usually just a static number. You may project Jamaal Charles to score 300 points while Ridley scores just 200, but how confident are you that Charles will score that 300? Should we lower expectations based on ambiguity? Andy Reid, Alex Smith – aren’t those factors that could make or break Jamaal’s 2013? And aren’t we unbelievably confident that one of the most talented receivers of our era can haul in a top-5 fantasy score? Wouldn’t we think – given the way Detroit runs their offense – our Calvin Johnson projection would be more accurate than our Jamaal Charles one? There’s some uncertainty when you look at 2013 first-round running backs. You see this every year. However, the reason we still draft them early is because there aren’t many running backs getting consistent touches throughout a season. The demand is high (you start at least two of them in your standard league) and the supply is low (only 35 of them ranked in the top-24 more than 3 times in 2012). The risk is certainly outweighed by the reward, because if you get a top running back in fantasy football (hello, Adrian Peterson), the chance that you’ll outscore your opponent at that position on a weekly basis becomes immensely high. Running backs are the most important position in fantasy football. If you don’t believe me, read my book. But the thing I’ve come to notice in these mock drafts isn’t so much the change in running back predictability from 2012 to 2013. And it’s not even the lack of quarterback selections in rounds one and two. It’s the clear drop off in running back talent at the beginning of Round 3, and the obvious drop-off in receiver talent after the first part of the second round. Let’s use a recent mock draft I participated in as an example. Johnson went at pick number eight in the first round, after seven running backs were selected. When Megatron’s team drafted in Round 2, they had their choice between backs like Stevan Ridley, Darren McFadden, Maurice Jones-Drew, DeMarco Murray and Chris Johnson. While those guys are obviously not as reliable as some of the first round running backs, they’re still respectable selections. In Round 3, when that same team drafted, they began to see a huge drop off in sure running back talent. David Wilson and Lamar Miller, though they could be stars, were the best available backs. Trusting them as your RB2’s next season (right now, at least) could be risky. By selecting Megatron early, you now have a pretty big question mark at RB2, even if you get another back in Round 4. Now let’s pretend that you had the fourth pick in your draft. Instead of going with Spiller, Charles, Lynch or Martin, you opt for Megatron. It appears you missed out on a top running back, but truthfully, given the way some of these mock drafts have gone, you may still be able to get two very solid running backs in Rounds 2 and 3. As I mentioned above, you may be able to pair Chris Johnson with MJD, or Darren McFadden with DeMarco Murray. Though they obviously aren’t risk-averse, they’re proven in one way or another. But if you do go this route, I’d encourage you to draft a running back towards the end of Round 4. Get someone in line for touches, but may not be the most talented guy in the world. Vick Ballard is the perfect example. Plodders are the perfect example. Once Round 5 hits, you’re then able to get a solid WR2 to go with Megatron, and you’ve already selected three running backs who should be able to produce on a weekly basis. I’m not saying this is the exact direction you should take with your drafts in August, but I do think it’s an intriguing one. Clearly, every fantasy draft is going to be different. But if we value Calvin Johnson the way his numbers tell us to, then there should be little doubt that he’s a top-half first round selection. Even though the wide receiver pool is insanely deep, there’s something to be said about a receiver who finished in the weekly top-12 eight times last season (excluding Week 17). And because the drop off at running back appears to occur in the beginning of Round 3, you may be able to afford an early-first round choice on the Lions’ receiver. 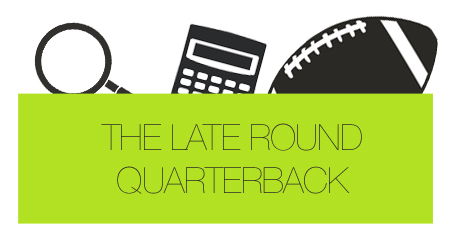 Most of this, too, is under the assumption that quarterbacks won’t leave the board until Round 3. For the most part, fantasy footballers drafting during this time of year have seen the value in drafting a quarterback late, and recognize the unbelievable depth at the position in 2013. While that makes me smile, it also will make the fantasy leagues I participate in more competitive next season. We should, however, see quarterback ADP’s rise as we approach July and August. Regardless, the next time you’re at the top spot of drafts, give the early Megatron approach a try. You may be surprsied at how talented your lineup looks. And if you’d rather not have to play this ridiculous ADP game, auction drafts are always available.